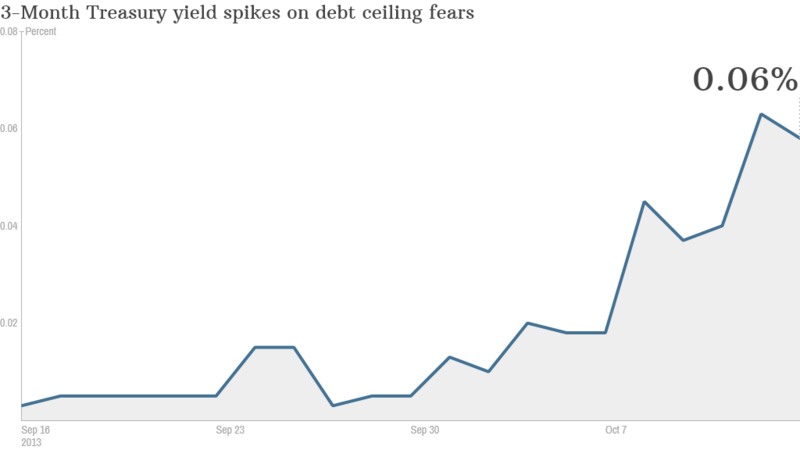 Short-term bond rates are rising on debt ceiling worries. They may continue to do so if there is no deal soon. Click chart for more on bonds. The U.S. is inching closer to a possible default on some of its debt later this week. And unless a deal is struck between President Obama and Congressional leaders on Monday, short-term Treasury bonds could get hit hard again when bond markets reopen Tuesday morning. Interest rates on short-term U.S. Treasuries, so-called T-bills due in the next few weeks and months, spiked early last week as investors began to seriously weigh the possibility that Congress would fail to raise the debt ceiling. Higher rates are a sign of nervousness since rates go up when investors sell bonds. Short-term rates dipped slightly towards the end of the week as a deal looked more likely. But optimism faded over the weekend. Investors aren't the only ones worried about a possible default. International leaders, such as IMF chief Christine Lagarde and China's Vice Finance Minister Zhu Guangyao, have been criticizing U.S. politicians for putting the global economy in jeopardy with the prolonged debt ceiling debate. "As each day goes by and progress isn't defined by a resolution, you are going to see an impact in short-term rates," said Jim Barnes, senior fixed income portfolio manager at National Penn Investors Trust. "This week is different because there are more voices outside of the United States talking about how urgent a deal is." In another corner of the market, investors are also boosting their bets on a default. The price of credit default swaps that pay investors should the U.S. fail to make its interest payments on its debt has nearly doubled -- from 22 cents for every $100 to hedge against a default in September to 38 cents this week, according to Markit. That's still well below where these CDS prices were in July 2011, the last time the U.S. flirted with default. Three years ago, the price was 65 cents for every $100 according to Markit. While most investing experts expect a resolution before the Thursday deadline when Treasury will start to run out of money to pay all its bills on time, many major financial institutions are taking pains to protect themselves in the event of a default. In particular, firms are selling short-term Treasuries -- which would be among the riskiest investments if the debt ceiling is not raised. Last week, JPMorgan Chase (JPM) CEO Jamie Dimon said he was certain that the U.S. would not default. But he acknowledged that the bank's money market funds have sold most of their short-term Treasuries. "The company has made enormous preparations for any crisis, as we get near the debt ceiling." Some of the world's biggest money market funds -- including Fidelity's money market funds (but not its bond funds) -- have sold all Treasuries due in late October and early November. Charles Schwab (SCHW) said its money market funds minimized exposure to government debt that's "most likely to be negatively impacted by unresolved budget and debt issues." Oddly enough, many bond investors have thought that a U.S. default might cause a short-term rally in U.S. Treasuries, pushing down long-term rates. The argument is that this once unthinkable event would so destabilize world markets that investors would hunt for a safe haven. And despite a default, longer-term U.S. government debt would still be considered the most stable investment in the world. Still, some analysts are starting to question how long U.S. bonds might be considered a good bet. Treasuries could lose their luster if a default goes on longer than a few days. Bond yields could move "high as investors worldwide call into question the U.S. dollar's status as the global reserve currency and -- frankly -- the stability of the US itself," wrote analysts at Aberdeen Asset Management in a research note. That's why it will be very interesting to see what happens with bonds on Tuesday. There was no trading in the fixed-income market Monday due to Columbus Day. Barnes is expecting short-term Treasury yields to spike again. But he's really looking to see if there's any movement in longer-term rates. "It seems that investors expect that this will all be resolved eventually," said Barnes. "You'll know that investors have started thinking that something catastrophic could happen if longer-term rates start moving up." CNNMoney's Hibah Yousuf contributed to this article.